The tradition of Chinese kung Fu attaches utmost importance to the cultivation of martial virtue. Kung fu learners consider it first important to respect their teachers and adhere to the principle. Therefore, an expert of kung fu is venerated by his colleagues first of all because of his martial virtue, and secondarily because of his martial skills. Chinese kung fu has all along considered important the difference of seniority. A scandal recently broke cover when Sifu Leung Ting of the WingTsun School falsely claimed himself to be “Head of the Wing Chun School”. 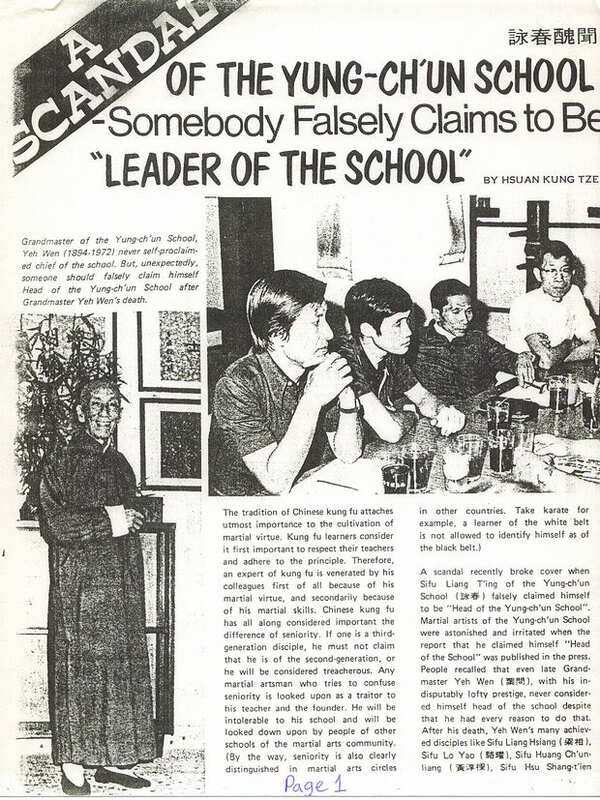 Martial artists of the Wing Chun School were astonished and irritated when the report that he claimed himself “Head of the School” was published in the press. People recalled that even late Grandmaster Ip Man, with his indisputably lofty prestige, never considered himself head of the school despite that he had every reason to do that. After his death, Ip Man’s many achieved disciples like Sifu Leung Sheug, Sifu Lok Yiu , Sifu Wong Shun Leung, Sifu Toi Shan Tin and the internationally renowned Bruce Lee, etc. all have been eligible to be elected the head. But none of them ever attempted to be the leader of the Wing Chun School, neither had anyone moted the election of a head. The press conference of the Wing Chun School gained wide attendance and the people there were emotional. Apart from the many chief instructors of the School, it was attended by senior members of more than ten schools and more than ten leading members of the Chinese Martial Arts General Association of Hong Kong, as well as innumerable journalists. 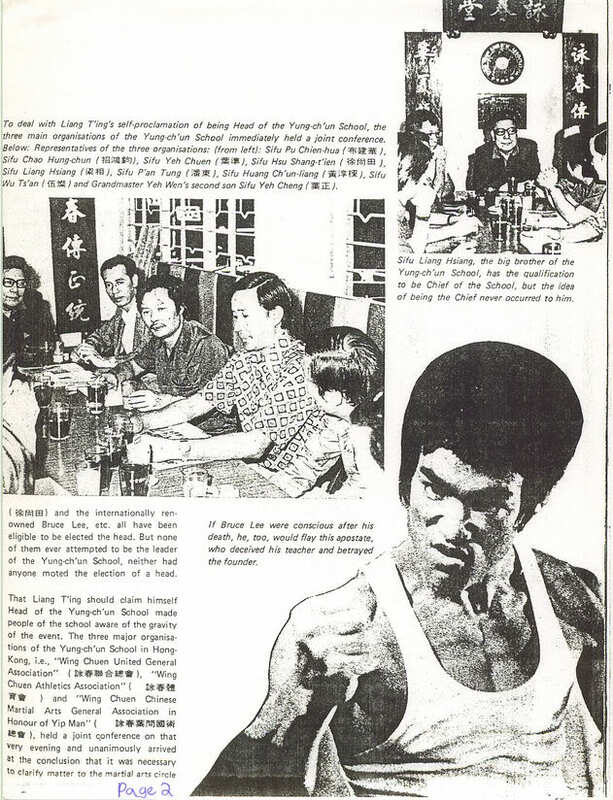 Now, after all, is Leung Ting a disciple of Grandmaster Ip Man? Ip Man’s eldest son Sifu Ip Chun testified that he had never seen his father teaching pugilism to Leung Ting. 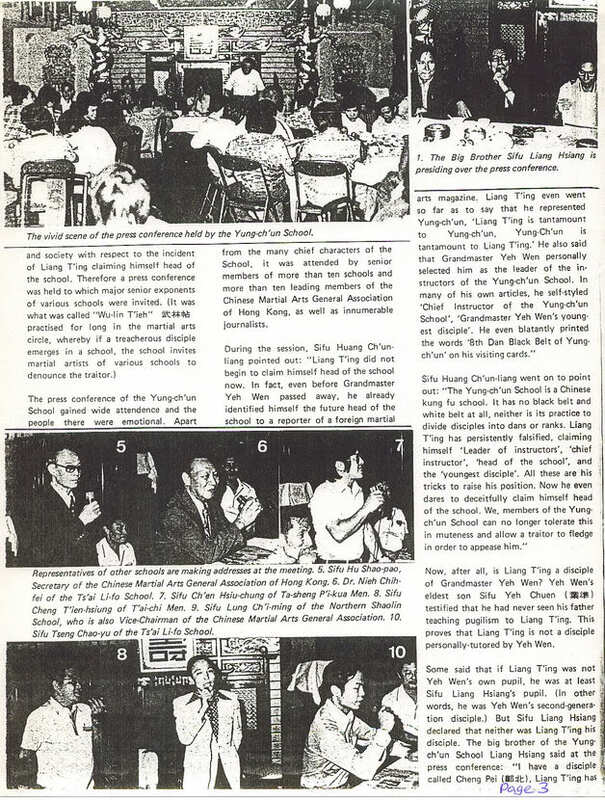 This proves that Leung Ting is not a disciple personally-tutored by Ip Man. 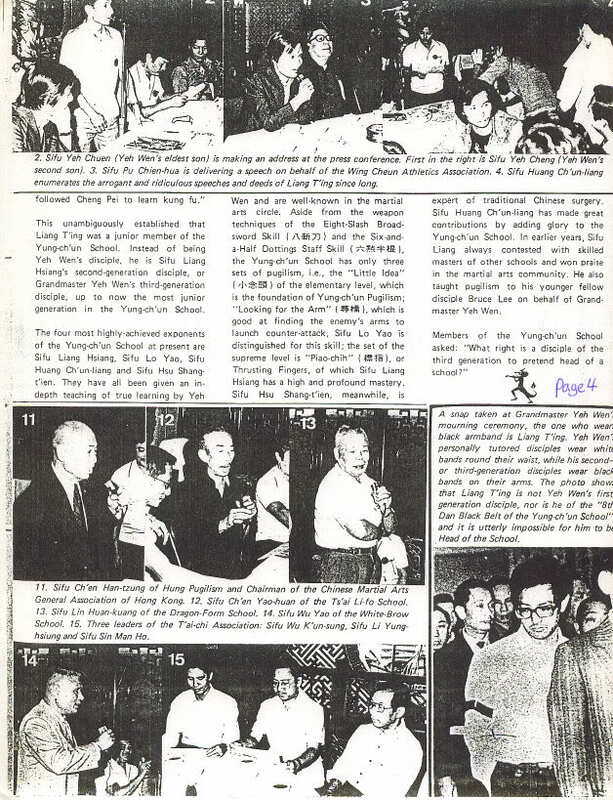 This unambiguously establishes that Leung Ting was a junior member of the Wing Chun School, instead of being Ip Man’s disciple, he is Sifu Leung Sheung’s second generation disciple, or Grandmaster Ip Man’s third-generation disciple, up to now the most junior member in the Wing Chun School. The four most highly-achieved exponents of the Wing Chun School at Present are Sifu Leung Sheung, Sifu Luk Yiu, Sifu Wong Shun Leung and Sifu Toi Shan Tien. They have all been given an in-depth teaching of true learning by Ip Man and are well-known in martial art circles. Aside from the weapon techniques of the Eight-Slash Broadsword Skill and the Six-and-a-Half Dotting Staff Skill (the Wing Chun School has only three sets of pugilism, i.e., the “Little Idea”, of the elementary level, which is the foundation of Wing Chun Pugilism; “Looking for the Arm”, which is good at finding the enemy’s arms to launch counter-attacks, Sifu Lok Yiu is distinguished for this skill; the set of the supreme level is “Biu Gee”, or Thrusting Fingers, of which Sifu Leung Sheung has a high and profound mastery. Sifu Toi Shang Tin, meanwhile, is expert of traditional Chinese surgery. Sifu Wong Shun Leung has made great contributions by adding glory to the Wing Chun School, in earlier years, Sifu Leung always contested with skilled masters of other schools and won praise in the martial arts community. 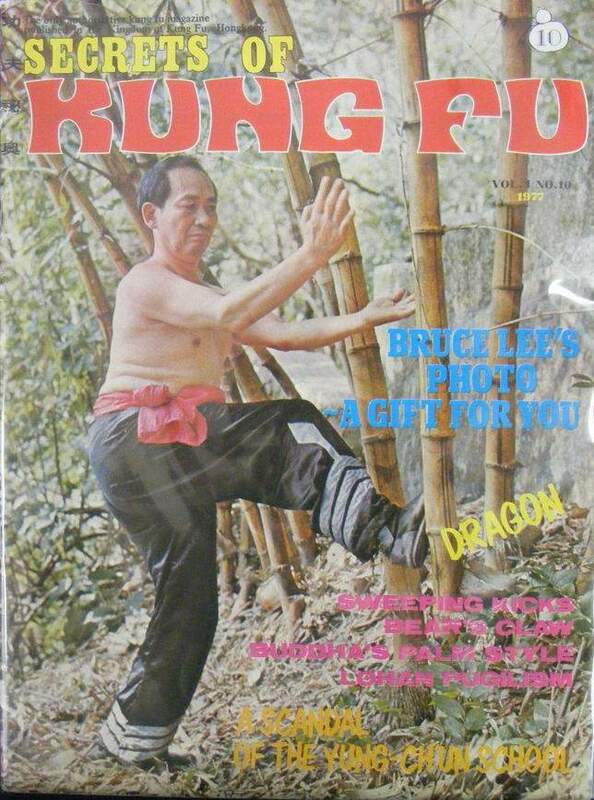 He also taught pugilism to his younger fellow disciple Bruce Lee on behalf of Grandmaster Ip Man.